Percy’s story came to light from a box given to us by an elderly neighbour. The box contained a family’s story of four brothers who all served in WW1. The precious contents of that box are now 100 years old and the story can be told. Percy was born on 30th March 1895 in Carlton, Melbourne. When he was 15years of age, his father died, so Percy left home and went “bush” in country Victoria working as a farm hand, to help support his mother and younger siblings. He was nicknamed “Cardie”, tall and thin, with fair hair, a quiet sort of chap, as his younger brother described him. Percy enlisted on 1st July 1915, he was 20 years old, following his two older brothers, Alaric Arthur Cardwell, 26yrs, and Rupert Edgar Cardwell,22yrs, his younger brother Quentin Charles Cardwell ,18yrs,joined a few months after Percy. Percy left Melbourne on 10th September 1915 on board the “Star of Victoria” bound for Egypt. After disembarking in January 1916 at Tel-el-kebir, he was sent to Alexandria before joining the British Expeditionary Force; in March 1916 he then embarked to Marseilles, France. He spent some time in and out of the field and hospital suffering from trench foot and returned to his Battalion who in August 1917 had moved on to Belgium. On 16th September1917 he was promoted to Lance Corporal. Percy was a Lewis gunner; on the morning of 4th October 1917 “the Battle of Broodseinde” Passchendaele ,he was in a trench that was being used as a listening post, he was K.I.A by a sniper. Percy was buried behind a ridge in open ground, with his rifle and a note inside his steel hat to identify him. After the Battle he could not be found, so like many others who fell that day, Percy has no known grave, he is memorialised on the Menin Gate (panel 7) Ypres, Belgium. Alaric Arthur Cardwell, Married with a young child, came home to his family, but suffered the rest of his life with crippled feet due to rheumatism and the effects of trench foot. 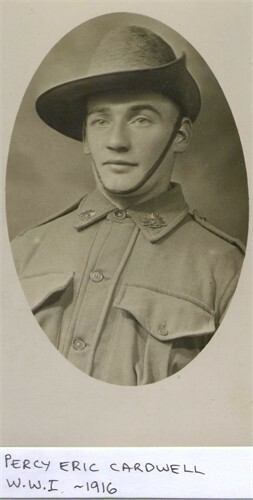 Rupert Edgar Cardwell, Died of wounds during the Battle of Lone Pine, Gallipoli, he lay in the field for four days, having had his left foot blown off, before being bought to the ambulance station where he passed away. He is buried at Beach Cemetery, Gallipoli. Quentin Charles Cardwell, Percy’s youngest brother was 18 when he left for France; he almost got to the front line before being sent home, as his widowed mother had already lost two sons. Quentin was our neighbour’s father, who kept his mothers memorial box and memorial book.